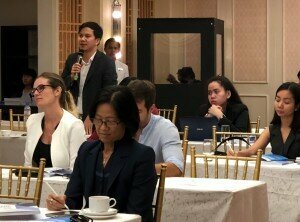 EuroCham Cambodia, on behalf of GIZ “Support to the Initiative for ASEAN Integration (IAI)”, organized two workshops on Public Private Partnerships (PPP) in the healthcare sector on 28th September 2018, and in tourism sector on 01st October 2018, Phnom Penh, aiming to address how to enhance the investment environment and promotion strategies in the health and tourism sectors where public and private sectors can better collaborate. Government officials from Ministry of Economic and Finance (MEF), Ministry of Health (MoH), Ministry of Tourism (MoT), business representatives, and experts from GIZ, B. Braun Melsungen AG, DFDL, and Partner at Sarin & Associates, participated in the workshops to share experiences and exchange information on PPP, and investment climate of Cambodia. 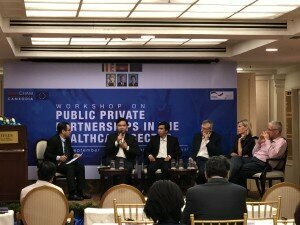 Each workshop was divided into 4 sessions followed by panel discussion: (1) Investment trends in the healthcare and/ tourism sector; (2) PPP legal framework in Cambodia; (3) PPP potential in the Cambodian healthcare and/ tourism sector; (4) Example of a successful PPP in the healthcare and/ tourism sector, and Panel Discussion: How to Promote PPP in the Healthcare and/ Tourism Sector? in return the government allows the private party to collect revenues from revenue-based payment, availability-based payment or hybrid payment. Participants received valuable information and practical example on successful cases of PPP from the key speakers. A new PPP law is currently being drafted and expected to be released by mid of 2019, followed by Standard Operating Procedures (SOPs) to provide detailed guidelines on implementing PPP projects. As a result from the workshops, the Government entity encourages investors to examine the Public Investment Program 2016-2018, and the Tourism Sector Development Plan to identify potential projects in which the MoH and the MoT would require investment, and propose whether they could be achieved through a PPP. It is important that there is a clear mechanism or strategy paper on PPP in healthcare and tourism sectors once the law on PPP is adopted. Private sector is encouraged to actively participate in providing inputs to Ministries starting from the PPP project identification stage to project implementation stage. On the other hand from private sector’s perspective, the formalizing a public-private forum will increase the opportunities for the public and private sectors to work together, improve the regulatory environment and lead to increased opportunities. 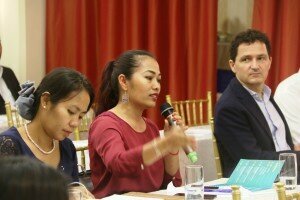 Experts also suggested that development partners should get involved in PPP development in Cambodia through the Ministry of Economy and Finance, and line Ministries. ASEAN-German Cooperation Project “Support to the Initiative for ASEAN Integration (IAI)” supports implementing ASEAN agreements including Trade in Services……… The project operates in Cambodia, Lao PDR, Myanmar and Viet Nam until November 2018.